NT statehood soon? I don’t think so. Photo at right: pushing for statehood online. Opinion polls show that Territorians are very strongly in favour of Statehood for the Territory. 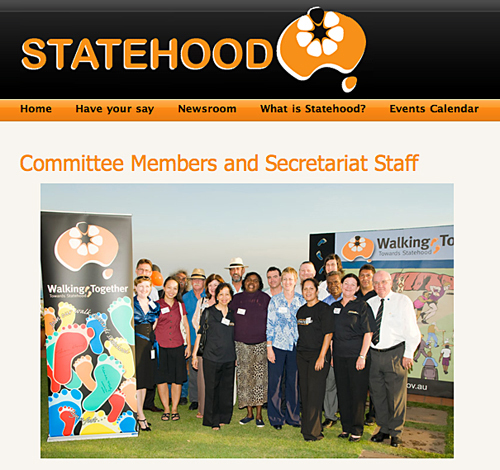 The opinion polls conducted by the NT Statehood Committee also show that Territorians are (by small majorities) against statehood if we do not have the same rights as other States, for example as in the number of Members and Senators in the Commonwealth Parliament or in our rights in referenda to amend the constitution. Presumably that is why the Statehood Committee’s submission to the House of Representatives Standing Committee on Territory Statehood insisted the objective was “eventual” equality with the other States. Unfortunately, whatever the results of the negotiations between the Territory and the Commonwealth, we will never be equal to the other States. That is because we will be made a State by an Act of the Commonwealth Parliament. So, even if all the issues to be negotiated (see below) are resolved there can be no mechanism that will protect the Territory from Commonwealth intervention. This will not be a Ministerial intervention (like the 2007 NT Emergency Response) but could be via an amendment to the NT Statehood Act, like the Commonwealth Parliament did in negating the Territory’s euthanasia legislation. It is my opinion that we cannot protect the Territory from such interventions in our affairs. Even if the NT Statehood Act contains an entrenched condition that the Commonwealth has no power in Territory affairs, this cannot bind future Commonwealth Parliaments from amending our Statehood Act (or any Act for that matter). The Commonwealth cannot override State legislation in areas that the constitution determines are State responsibilities, unless such State legislation is contrary to international treaties to which Australia is a signatory. This is because the Commonwealth was created by the States ceding some of their sovereignty to create the Commonwealth. The States retain residual sovereignty; the Territory’s sovereignty will be by grant from the Commonwealth and could be amended by any future Commonwealth Parliament. Let us look at some of the matters that have to be negotiated. The Commonwealth will not agree to the new Territory State having the same minimum federal representation as is the minimum for any established State (5 MHRs and 12 Senators). So we will only achieve that as the Territory’s population grows. Extra House of Reps seats will be allocated on a population quota; further Senators will only be allocated on the basis of the nexus between House of Reps Seats and Senate positions. So in 50 years time we could have a population greater than Tasmania but with fewer Senators. Similarly the Territory will not achieve its objective of having the Territory count as a separate jurisdiction in referenda. That is because it will change the ratio of States required to change the constitution in a referendum. At present any referendum proposal has to win four of the six States. Changing that to four of the seven States will assuredly lead to vehement opposition from constitutional conservatives in the four smaller current States. I think the best solution here is for the Territory to be included in South Australia for referenda votes. Then we would have the same “rights” as other Australians in determining the success or failure of referenda. Note: before anybody gets outraged about this, remember that Commonwealth Territories are routinely included (eg Christmas Island in the seat of Lingiari) in federal electorates for national elections. There are a number of other Commonwealth interests in the Territory that may bedevil any negotiations. One of these is that the Commonwealth wants to put its nuclear waste dump here because the other (sovereign) States will not allow such a facility. We will have to accept that waste dump if we are to be granted statehood status. Unlike in the other States the Commonwealth owns considerable lands here. The Territory wants these to be handed to the new Territory State without recompense. That may be problematic. Another element of this issue is the Commonwealth’s use of the 1953 Atomic Energy Act to control uranium resources and mining in the Territory. This issue is intertwined with Commonwealth control over particular National Parks (Kakadu and Uluru/Kata Tjuta). Mining royalties is another problematic issue. When the Commonwealth granted the NT self-government it exempted both Ranger and Gove from the NT mining royalties regime (Canberra pays its royalties from these back to the NT). But if the Territory were to secure control over these mines then they would be paying much higher levels of royalties. That is because the NT mining royalties regime essentially garners resource rental royalties (taxes on mining profits) whereas Ranger and Gove pay an ad valorum royalty (a royalty on the value of production). The Territory’s royalty regime is designed to encourage new mines with little or no royalty costs and to tax profitable mines. So, as long established mines, Ranger and Gove would pay more and can be expected to resist this possible consequence of NT statehood. There are supposedly 28 Commonwealth Acts that apply directly to the NT. This creates a fearsomely complex negotiating web. The NT Statehood negotiators will need great competence to secure the best deal for the NT from these negotiations. Then of course there are Aboriginal issues at stake. Indeed some might argue that these are the most complex because the Commonwealth regards the NT with some scepticism in this regard. It is an almost universal perception amongst Commonwealth policy-makers that the NT is failing to secure Aboriginal advancement, if not short-changing Aborigines with its fetish (for example) for boat ramps for amateur fisherpersons in Darwin. Securing Aboriginal interests (rights?) 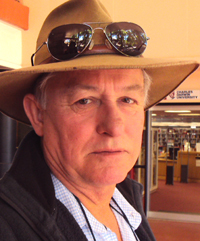 in the Territory Government’s fiscal allocations will have to be entrenched in any proposed new Territory constitution. Indeed this is part of a broader issue of expenditure bias towards Darwin and relative neglect of the Territories’ regions. The so-called “patriation” of the Land Rights Act would also be a complex matter. Remember that the Land Councils’ concerns about that possibility were an important factor is defeating Shane Stone’s statehood referendum. So if the Land Rights Act was put under the new Territory State, Aborigines would have to be assured that their rights and privileges were entrenched and not liable to erosion under any future amendment to the NT State Constitution. It is clear that the NT has to create a constitution before our push for Statehood will be taken seriously by the Commonwealth. That is why next year’s Constitutional Convention is so important. We have to develop a document that the Commonwealth (and the States) consider exhibits a maturity and social and political inclusiveness that we are at present seen as lacking. Even if we achieve that result, I still see that the complexity of the negotiations with the Commonwealth – as well as our low station on the list of the nation’s priorities – means that NT Statehood is probably decades away. I don’t think, though, Mr Gerristsen’s point about the ‘Territory State’ being established by an Act of Parliament is right. According to one view the Commonwealth can impose terms and conditions prior to admission but will then be limited to the powers it has with other states (under s 51). This would mean that even if a Commonwealth Act was needed to provide the detail around establishing the State the power to make this law would arise from section 121 of the Constitution and this power would be exhausted from the time the State came in to being. It wouldn’t be able to be amended then because there wouldn’t be a head of power to do so, I wouldn’t think. The power by the Commonwealth to override the Euthanasia law that Mr Gerritsen mentions is a direct consequence of being a Territory rather than a State so wouldn’t be relevant. The power the Commonwealth has to make laws in Territories is almost unlimited (under section 122). Whereas in States the power must be expressly provided for under s 51.